On 3rd September 2015, Perbanas Institute hosted an event with Indonesia’s Financial Services Authority (OJK) highlighting the topic of “Indonesia’s Finance Industry Prepares for the ASEAN Economic Community” at the fully-packed auditorium of the institute’s Unit III building. Vice-Rector of Academic Affairs Mr Patria Laksamana, S.E., MBA, Ph.D. opened the general public lecture session placing emphasis on the dynamic changes surrounding Indonesia’s current economy. 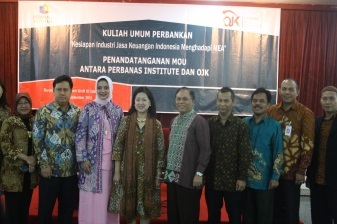 Perbanas Institute demonstrated its commitment to providing high-quality banking education by also signing a memorandum of understanding (MOU) with the OJK carried out by the institute’s Rector Prof. Dr. Ir. Marsudi Wahyu Kisworo and the OJK’s Commissioner on Education and Consumer Safety, Dr Kusumaningtuti Sandriharmy Soetiono, S.H., LLM. Several other prominent faculty members in attendance include the Dean, Heads of Study Programmes and several lecturers, Heads of Bureaus as well as Perbanas Postgraduate School’s lecturer, Dr Marissa Haque Fawzi, as the event moderator along with a large student presence. The event’s honourable guest speaker, Dr Kusumaningtuti presented comprehensive insights and in-depth information regarding Indonesia’s strategic factors that have led the country to enjoy nearly a decade of strong economic growth. Despite the recent economic slowdown, Indonesia’s finance industry remains resilient through attaining steady levels in credit ratings and non-performing loans. Highlighting a drawback to the country, Dr Kusumaningtuti shared that financial literacy rate throughout the archipelago remains one of the lowest in the Asia Pacific region. Studies have shown that communities with easy banking services thrive better as in the case of Singapore. As such, OJK has partnered with the Ministry of Education to strengthen the community level to drive stronger economic growth through education on saving money and financial management. As a leading institution in banking, finance, and information technology, Perbanas Institute has the upper-hand in high-quality teaching methods and a strong industry network with partners such as the OJK, supporting its successful role in supplying Indonesia’s demand for proficient bankers.